Azzurra sailing in the Louis Vuitton Trophy off Nice, November 2009. Image copyright Stefano Gattini/Azzurra. The Italian sailing team Azzurra, skippered by Francesco Bruni and with Tommaso Chieffi calling tactics, today finished a training session in Valencia in preparation for the Louis Vuitton Trophy which will take place in Auckland from 9th to 21st March 2010. Azzurra will be one of the favourites in the regatta after beating Emirates Team New Zealand to win the previous Louis Vuitton Trophy event in Nice in November 2009. The team has been training on SWE63, the version 5 ACC boat used by Victory Challenge in the 32nd America’s Cup. Bruno Peyron Relaunches The Race! Three times holder of the Jules Verne Trophy and creator of The Race, the non-stop crewed race around the world without outside assistance and without limits, Bruno Peyron has officially announced that he has decided to relaunch The Race. After several months of studies and some careful thinking and after consulting the main potential competitors, a second edition of the race around the world for the giant G-class boats is therefore planned for 2013-2014, starting from a port in Southern Europe. After talks with leading maxi-multihull G-class skippers, it transpires that out of the dozen giants that have so far been built, between eight and ten of them may be lining up for the start of The Race, and that is without counting any new boats, which may be built by then, in particular using moulds from the latest multihulls from the most recent generation. Bruno Peyron, who took some time to think about this before coming to a decision explains: “As I’ve been able to stand back and gain some perspective since I last took part in the Jules VerneTrophy, there are several things I noticed that led me to take this decision to relaunch The Race. First, since the recent America’s Cup that we have just seen, we can conclude that we French are no longer alone in the world of multihulls and that is excellent news. We are entering a new era. We can see too that since The Race, 12 giant multihulls have been built, including four in the past three years. So today there are certainly enough boats of sufficient quality for us to propose this event relaunch to their skippers and partners, without counting any new multihulls, which may be built following on from this by 2013 or 2014. I have noticed that some major brands have been looking at the possibilities offered by the Volvo Ocean Race, which I can fully understand, but this does indicate that there is simply no alternative international race for multihulls. And just to conclude, others around me have become aware of this and share this feeling and my discussions with the leading G-class skippers have led me to move things forward in this direction. The new 100-foot class (of which three are already up and running and a fourth is about to be made ready) has shown what these innovative boats can do sailing around the world via the three legendary capes while budgets remain limited. So, in this respect, it is now much easier to be able to take part in The Race. After talks with various agencies specialising in sports marketing, Bruno Peyron has decided to award the overall management of The Race event to Thierry Reboul. Former Head of Advertising for Air France and Head of Communications at Alcatel, Thierry Reboul was the founder of the Ubi bene agency, which specialises in promoting events. He will in particular be in charge of organising and negotiating with the main partners and the official event sites. A call for tender will be launched to complete the arrangements with an international team, which will be appointed as executive producers. The Race: Created by the French sailor Bruno Peyron, The Race started on 31st December 2000, as a way to celebrate our arrival in the third millennium with a global ocean race. The Race was the first race around the world without limits, in other words it was open to boats without any size restrictions. The total freedom that was given to designers led to the birth of a new generation of sailboats, maxi-multihulls, now known as the G-Class. For the first edition of The Race, the first giant multihulls ever built set out from the start in Barcelona to sail around the world via the three capes (Good Hope, Leeuwin and the Horn) before crossing the finish line in Marseilles. The reference time for the race was set by the New Zealander Grant Dalton aboard the maxi-catamaran Club Med, which completed the voyage in 62 days, 56 minutes and 33 seconds. 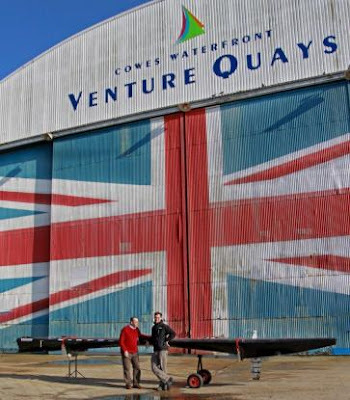 Paul Larsen and Malcolm Barnsley with Vestas Sailrocket 1. Image copyright Vestas Sailrocket. Sailrocket 1. Image copyright Vestas Sailrocket. VESTAS SAILROCKET 1 will be on public display in all her battle scarred glory at the upcoming RYA VOLVO Dinghy Show, Alexandra Palace, UK, March 6-7th. 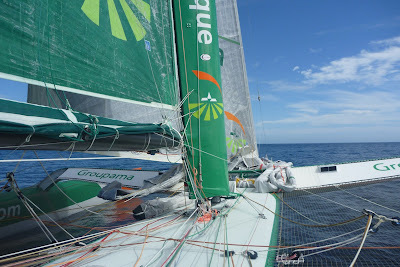 On board Groupama 3. Image copyright Team Groupama. "We're going to unfurl the heavy gennaker as the NW'ly wind is easing off a little. In fact we're switching between the solent jib when there's 30-35 knots and the small gennaker when there's no more than 27-32 knots of breeze. We're really copping it at the helm... It's raining a lot and there are big seas. That's why we're avoiding sending anyone up to the foredeck. I prefer a helmet but some of the others are wearing ski masks to stand up to the spray as it slaps against your face. Fortunately the water isn't cold..." stated Fréd Le Peutrec, at the 1130 UTC radio link-up with Groupama's Race HQ in Paris. "We look to be on target to maintain this pace as far as Tasmania, or even as far as New Zealand. We may have to put in a few gybes to reposition ourselves, but the trajectory will remain very straight, in contrast to Orange 2 in 2005... For 48 hours, we're still going to be pushed along by this thirty knot wind, then it will ease a little but the W'ly breeze will accompany us as far as the Pacific. Furthermore, if the depression stagnating over Auckland Island evacuates, we won't have any real transition to negotiate at that point, which would be quite good!" "It's soaking both outdoors and in, both on the inside and the outside of our foulies! The levels of humidity have reached 100% and the heating doesn't work... As such there isn't a little corner by the `fireplace', despite Ronan's best efforts to fix the problem. Fortunately it's fairly mild since we're on the southern edge of a zone of high pressure, with wind dropping down off Africa. We're being tailed by petrels and albatrosses..."
Adam Minoprio and his BlackMatch Racing team will be sailing on board BMW ORACLE Racing next week, during the Al Maktoum sailing Trophy RC 44. 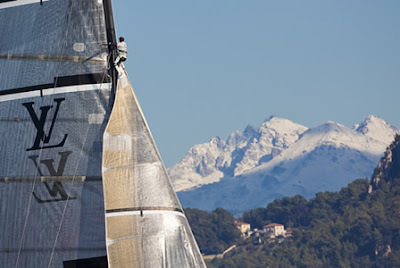 Image copyright Raffaello Bastiani/RC 44. 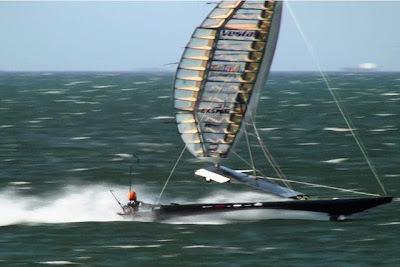 The first regatta of the RC 44 Championship Tour 2010 will take place next week in the United Arab Emirates. Organised by Dubai International Marine Club (DIMC), the Al Maktoum Sailing Trophy RC 44 will reassemble nine world Class teams and sailors including Ray Davies, Terry Hutchinson, Cameron Appleton, Rod Davis and many more. Unable to attend the event due to their America’s Cup post-victory commitments, Russell Coutts and Larry Ellison have decided to give the opportunity to an up & coming team to test its skills at the world’s top level. Adam Minoprio and his BlackMatch Racing team - the winners of the World Match Race Tour 2009 - have been chosen; they will sail onboard BMW ORACLE Racing for this event. In the thick of the fleet. Image copyright Frank Quealey. Five times Giltinan champion Trevor Barnabas turned the clock back more than a decade when he won the resail of Race 3 of the Giltinan Championship on Sydney Harbour today. Trevor took over as replacement skipper on Fisher & Paykel for this regatta and showed that despite his ‘retirement’ he has lost none of his skills in an 18ft Skiff. 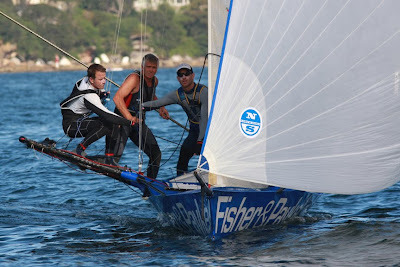 Along with crewmen Gerard Smith and Brent Dennis, Barnabas came with a late challenge to win by 21s from series leader Thurlow Fisher Lawyers (Michael Coxon, Aaron Links, Trent Barnabas). Fisher & Paykel. Image copyright Frank Quealey. Project Racing (Andy Budgen, James Barker, Matt Mc Govern) was a further 15s back in third place, with Gotta Love It 7 (Seve Jarvin, Sam Newton, Tom Clout) fourth. Sharks/Coldwell Banker Real Estate (Evan Walker) was fifth and Panasonic (Jonathan Whitty) sixth. These placings are provisional at this stage as there are protests pending. With discards taken into the pointscore, Thurlow Fisher Lawyers leads on 8 points, followed by Project Racing on 10, Gotta Love It 7 on 13 and Rag & Famish Hotel (John Harris) on 18. Western Australia’s Slam (Grant Rollerson) is next on 26 points, followed by Smeg (Nick Press) on 28, Yandoo (John Winning) 30 and Fisher & Paykel 32. Thurlow Fisher. Image copyright Frank Quealey. Today’s race was the re-sail of last Tuesday’s Race 3, which had to be postponed due to strong winds. Ironically, today’s race was sailed in a 5-knot ENE wind over a three-lap windward-return course. Most of the fleet favoured the southern side of the harbor with Project Racing, Fisher & Paykel and Gotta Love It 7 sharing the lead at the windward mark. This is where the pending protests are centred. After the downwind leg to conclude the first lap, Project Racing held a narrow lead over Gotta Love It 7, followed by Sharks/Coldwell Banker Real Estate, Fisher & Paykel and Thurlow Fisher Lawyers. Gotta Love It 7 picked up a shift along the southern shore to grab the lead from Project Racing off Steel Point. 7’s margin was 30s over Project Racing at the windward mark while Fisher & Paykel had edged ahead of Sharks/Coldwell Banker Real Estate. Mark rounding. Image copyright Frank Quealey. At the bottom mark the second time Gotta Love It 7 was just 7s ahead of Project Racing, Fisher & Paykel, Sharks/Coldwell Banker Real Estate and Thurlow Fisher Lawyers, which was 1m15s from the lead. The race took another turn on the final windward leg as Project Racing led by 30s from Fisher & Paykel. Gotta Love It 7 was now 1minute from the lead. Down the spinnaker run to the finish the race took yet another turn as Gotta Love It 7 and Thurlow Fisher Lawyers gained rapidly on Project Racing. 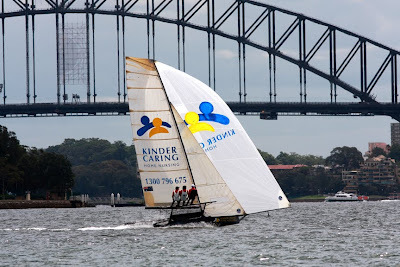 Trevor Barnabas took Fisher & Paykel to the northern side of the course while Project Racing, Gotta Love It 7 and Thurlow Fisher Lawyers were all close together off Rose Bay. When the two groups met near the finishing line, Barnabas’ move had paid dividends as Fisher & Paykel crossed the line as the others jostled in the almost non-existant wind. 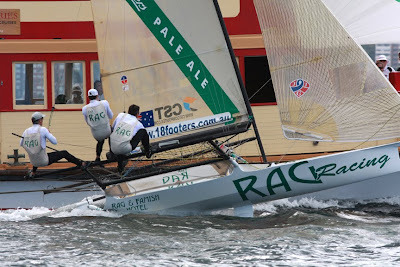 Race 6 will be sailed tomorrow (20 February) with Race 7 concluding the championship on Sunday. Notes: Sharks/Coldwell Banker Real Estate is receiving average regatta points in H4, as redress for a successful protest. 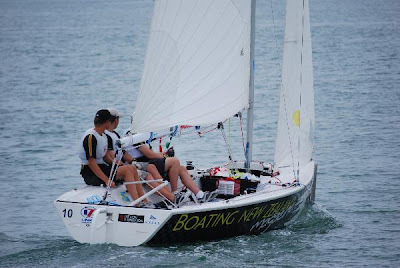 Mackenzie (CYCA) versus Hazard (RNZYS) on day one. Image copyright RNZYS. Racing was abandoned for the day on Friday. The Race Committee has been out on the course all day with a constant 30knots plus. Racing is scheduled to start at 10am tomorrow, Saturday. Josh Junior, RPNYC, Wellington, heads the leaderboard after day one. Image copyright RNZYS. Dean Barker vs. Ben Ainslie in match racing in the New Zealand National Match Racing Championships in the Farr MRXs on Auckland's Waitemata Harbour. Image copyright Chris Cameron. Some of the world’s top international match race teams are set to descend on Auckland for the Omega Auckland Match Racing Regatta in March. A mix of America’s Cup experience plus rising young talent will do battle in the invitational regatta on the Waitemata Harbour. The regatta kicks off the Auckland Festival of Sailing, which will see a crowded calendar of thrilling yacht racing through most of March. Now that the America’s Cup is once again back in play following the recent Deed of Gift Match in Valencia, top match racing skippers are honing their skills once more in preparation for a multi-challenger event expected to take place in 2013. The Omega Auckland Match Racing Regatta will be run by the Royal New Zealand Yacht Squadron and will take place off the Westhaven breakwater, where spectators will be able to watch the action. Skippers who have accepted invitations to compete are: Dean Barker (NZL – Emirates Team New Zealand); Ben Ainslie (GBR – TeamOrigin); Francesco Bruni (ITA – Azzurra Sailing Team); Sébastian Col (FRA – ALL4ONE); Karol Jablonski (POL – Synergy); Magnus Holmberg (SWE – Victory Challenge); Chris Dickson (NZL – formerly with BMW ORACLE Racing); Bertrand Pacé (FRA – Team Aleph, formerly Team French Spirit); Adam Minoprio (NZL – BlackMatch Racing); Torvar Mirsky (AUS – Mirsky Racing Team). Racing will take place in identical Farr-designed MRX yachts and will comprise a double round robin, semi-final and final. Weather permitting, the semi-finals and finals will be decided by the first skipper to win three matches. As the regatta approaches its climax on Thursday, Friday and Saturday (March 4 – 6), spectators and fans will be able to follow the action live on a dedicated radio station on 103fm organized through Live Sport. International yachtsman and commentator Peter Lester will provide expert analysis and blow by blow accounts of the racing. 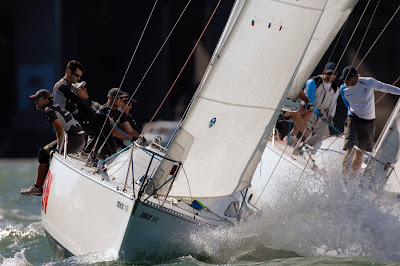 The Auckland Festival of Sailing comprises a series of on and off the water events. The Omega Auckland Match Racing Regatta is followed by the Louis Vuitton Trophy Auckland (where five of the skippers from the Omega regatta will also compete) and by the BMW Sailing World Cup Final. Also part of the festival is the Auckland International Boat Show. Chris Dickson leads younger brother Scott Dickson upwind in match racing in the New Zealand National Match Racing Championships in the Farr MRXs on Auckland's Waitemata Harbour. Image copyright Anne Hinton. All Rights Reserved. A triple Olympic gold (Sydney, Athens in the Laser, and Beijing in the Finn) and silver medallist (Laser in Atlanta) Ben Ainslie is Britain’s most successful yachtsman. He has won the world Finn Gold Cup five times. He is skipper of the British America’s Cup syndicate TEAMORIGIN and was backup skipper to Dean Barker for the Emirates Team New Zealand 2007 America’s Cup challenge. He has been the ISAF sailor of the year three times and British sailor of the year five times. 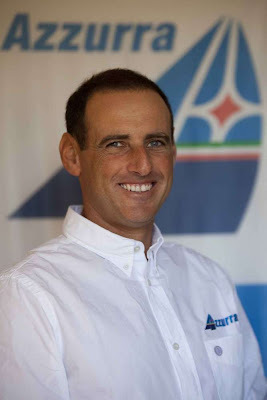 Italian Francesco Bruni is an accomplished match racing skipper, winning the Louis Vuitton Trophy Nice regatta in November 2009. He won the Italian match race championship in 2006 and was runner-up in that event in 2008. Bruni competed at the Athens Olympics in the Star, the Sydney Olympics in the 49er and Atlanta in the Laser. 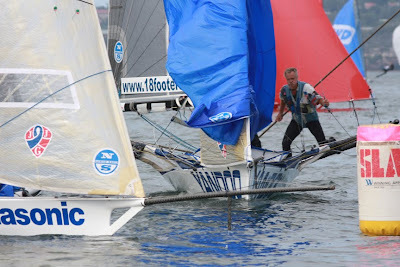 He was Italian Laser Champion from 1992-96, Laser World Champion in 1994 and topped the world 49er rankings in 2000. He is skipper of the recently re-formed Azzurra sailing team. Frenchman Sébastian Col has earned his stripes in world match racing. Ranked No. 1 match racer in the world by the ISAF from December 2008 to June 2009, Col was runner-up on the World Match Racing Tour in 2008. Col was the French match racing champion in 2000, 2001 and 2003. He has been involved with French America’s Cup challenges since the Le Défi 2000 campaign, more recently at the helm and member of the afterguard on the 2007 Areva challenge, and currently with ALL4ONE Challenge. 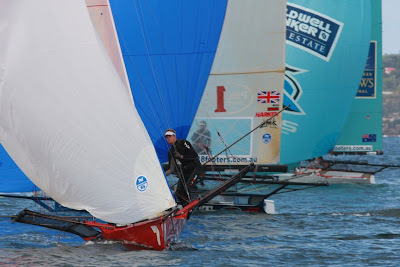 Dean Barker had a successful 2009, winning the Louis Vuitton Pacific Series in February and leading Emirates Team New Zealand to the position of overall champion on the Audi MedCup circuit. At Nice in November he helmed Emirates Team New Zealand to runner-up at the first Louis Vuitton Trophy regatta. Barker first sailed with Team New Zealand leading up to the 1995 campaign and was back with the team for the successful defence in 2000 and again in 2003. As skipper for the 2007 challenge, he led the sailing team through the pre-regattas of 2005 and 2006, and the victory in the Louis Vuitton Cup in 2007. 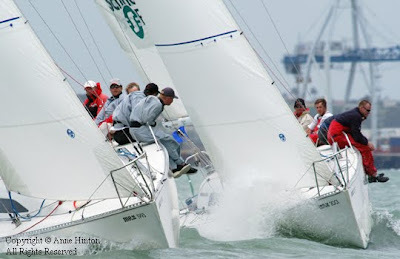 A professional yachtsman for 25 years, Chris Dickson returned to competitive sailing at the end of 2009 after a two-year break. He has won more than 20 international match racing regattas, has been the World Match Racing Champion three times and won 12 World Championships. Sailing with a youth crew, he was third at the recent NZ Match Race Nationals, and won both the San Francisco Big Boat Series and the Bay of Islands race week. He topped the ISAF world match racing rankings for 18 months and Pole Karol Jablonski has a string of top placings in World and European match racing championships to his credit. In 2007, he helmed the Spanish entry Desafío Español in the 2007 America’s Cup and last year sailed the fast-improving Russian entry Synergy in the Audi MedCup circuit and Louis Vuitton Trophy in Nice. He’s also an ice-yacht racer of note, having won the World Championships three times. Magnus Holmberg sailed with Victory Challenge as skipper and helmsman in the America’s Cup 2003 and 2007. He has represented Sweden at the Olympics three times, has six medals from European and World Championships, won gold at the Infanta Cristina (world match racing) Championships in the Soling in 1996. He has been ranked No. 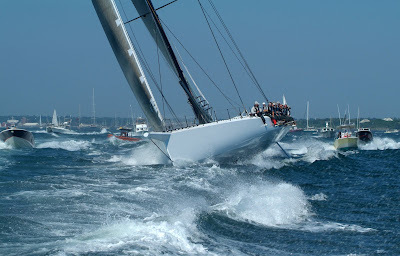 1 in the world match racing rankings and was overall winner of the World Match Racing Tour in 2000-2001. Racing under the BlackMatch Racing and Emirates Team New Zealand banners Adam Minoprio and his young crew of Nick Blackman, David Swete, Tom Powrie and Dan McLean, swept all before them to emerge as the 2009 ISAF World Match Racing Champions. 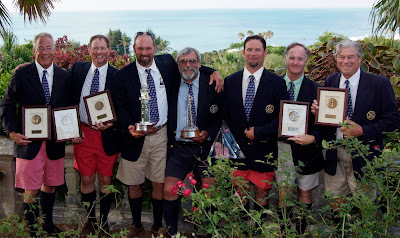 Along the way they won three regattas, were second four times and third once. 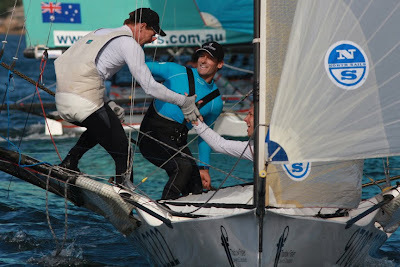 This consistent performance earned them the title of ISAF World No. 1 ranked match racing team. Frenchman Bertrand Pacé is no stranger to the waters of the Waitemata Harbour. He was back-up helmsman for Team New Zealand in the lead-up to the 2003 America’s Cup. His first America’s Cup campaign was in 1987 at Fremantle, followed by San Diego in 1992 and 1995, Auckland in 2000 and 2003 and Valencia in 2007. Pacé won the World Match Racing Tour in 2000 and was World Match Racing Champion in 1994 and runner-up in 1998 and again in 1999. After competing with distinction in a number of dinghy classes and youth match racing events in Australia and New Zealand, Torvar Mirsky formed Mirsky Racing Team. At the start of the 2006 sailing season Mirsky and his crew began their climb up the world match racing rankings. Two years later, aged just 23, he is in second place in both the ISAF and World Match Racing tour leader boards. Francesco Bruni of Team Azzurra. Image copyright Stefano Gattini/Azzurra. Azzurra will compete in WMRT events in Denmark, France, Korea, Portugal, Sweden and Switzerland from April to September of this year. 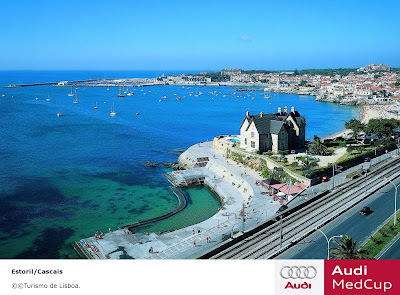 After several years as potential candidate venues for the Audi MedCup Circuit, two of Europe's most desirable cities, Barcelona and Cascais/Lisbon, have now been confirmed on the competition schedule for 2010. Caja Mediterraneo Region of Murcia Trophy, 18 09 2009. Image copyright © Ian Roman/Audi MedCup. World Sailing Management and city representatives of Barcelona and Cascais have now reached agreements to ensure that these venues will be two of the five which will constitute the 2010 Audi MedCup Circuit. “ It’s realising a dream for us in many ways. We have been wanting to go to Barcelona for a long time. In sailing it is one of the most renowned Spanish venues for every sailor, and also to Cascais, where strong wind should be assured”, said Nacho Postigo, Technical Manager of the Circuit. Estoril, Cascais, Portugal. Image copyright © Turismo de Lisboa. The Audi MedCup Circuit 2010 schedule opens with an entirely new venue. The year's first event will take place between the 11 and the 16 of May in Cascais, Portugal. Few cities in Europe can offer the weather conditions which the Portuguese city enjoys in spring and summer.. The reputation for strong, consistent winds was apparent when the city hosted the 2007 ISAF World Sailing Championships, and the venue is open to the Atlantic which should ensure big swells. “The usual race courses for the regattas held in Cascais start within the bay, where the prevailing wind can reach 10 knots, and from there, the boats sail to windward towards a mark set infront of the cape. There you can find 25 knots wind”, Postigo adds. It could be the Estoril Circuit of sailing, potentially one of the most exciting regattas of the season, a great curtain raiser, which would have a good chance to provide images reminiscent of the ones which emerged from the big days off Cartagena, where the boats surfed spectacularly on, and through, lumpy swells several metres high. After the Cascais Premiere, the Audi MedCup Circuit moves to Marseille, where the second trophy of the season will be disputed, between the 15th and the 20th of June. Barcelona. 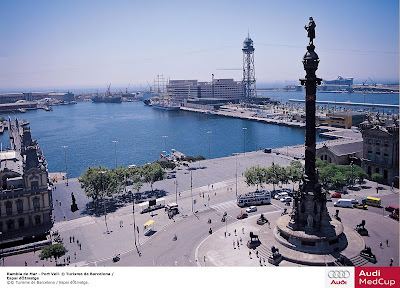 Image copyright © Turisme de Barcelona/Espai dOImatge. Barcelona will host the third event of the 2010 Audi MedCup Circuit between the 20th and the 25th of July. At this time the Catalan capital city enjoys great thermal winds of the southwest, known as Garbí. As well as the pleasant summer weather conditions, Barcelona is the perfect showcase for the Circuit, richly endowed with the experience and infrastructure of a city which holds many sailing competitions in Spain including the 1992 Olympic Sailing Regatta. The 2010 Audi MedCup Circuit event benefits from the full participation of the city hall in the organization of the events which will ensure a lively public village while the races take place on the water. And of course as a backdrop, the major European city needs no introduction as a cultural, architectural, culinary and nightlife capital that few can rival. After Cascais, Marseille and Barcelona, for the third time the Circuit is guaranteed an enhusiastic welcome in Cartagena in Murcia, Spain (24th till 29th of August) and on the Italian island of Sardinia, Cagliari (20th to 25th of September). The 2010 season will not only have new venues, but also new rules, which will make the boats faster and more spectacular. The TP52's new configuration includes a square topped mainsail, as well as bigger assymetric spinnakers on bowsprits instead of a spinnaker pole. Crew numbers are cut by two, which makes sailing more testing and more exciting. Also new is the new guest spot onboard every boat for each race. Nacho Postigo was in Valencia to meet Mike Sanderson, CEO of TeamOrigin the British America's Cup syndicate, one of the new entrants to the 2010 TP52 Series of the Circuit. The Kiwi Round the World Champion and former World Sailor of the Year updated the Audi MedCup's Circuit Technical Manager on his team's status, the boat's construction schedule prior to its debut in Cascais for the first time. Fred Le Peutrec. Image copyright Team Groupama. Though Groupama 3 has paid a heavy price at the entry to the Southern Ocean, she should soon get paid dividends from her investment in the Indian front... The very straight trajectory announced as far as the longitude of Tasmania is particularly favourable, not solely for making up her deficit on the reference time, but above all amassing a fair bit of credit at the beginning of the Pacific. Just a few weeks from the tax declaration, Franck Cammas and his men have really been hit hard by the wind crisis since passing South Africa! Fortunately the VAT only amounted to 2.5% in the end, which is the percentage of Groupama 3's deficit in relation to Orange 2's reference time established in 2005... In total then the current balance stands at around 440 miles in the red on this eighteenth day at sea. This Thursday lunchtime the giant trimaran, positioned to the South of the island of Crozet, had finally tracked down a twenty-five knot NW'ly wind, which she had been after for the past three days. With this new system the average speeds have really been given a boost at nearly thirty knots! "We're happy to have finally tracked down the wind we were expecting so it's pedal to the metal now! We've been making an average of thirty knots since this morning, and though conditions aren't quite stable yet, the speeds are becoming reasonable again... The past few days have been frustrating with this front which could easily have set us free: on three occasions we attempted to traverse it but it didn't work until the fourth attempt. Finally the front came to a halt but we had to bide our time... Right now it's not that cold as we're only at 42° South, though there's quite a bit of rain beneath the front. It's a fairly good sign because it's synonymous with us having escaped this latest obstacle" said Franck Cammas at the 1130 UTC radio link-up with Groupama's Race HQ in Paris, in the company of French news presenter Patrick Poivre d'Arvor. Sunset. Image copyright Team Groupama. "We're going to remain ahead of the front in around twenty knots of NW'ly wind (with some brief spells of thirty-five knots and over) throughout nearly the entire crossing of the Indian Ocean. We'll be able to follow what is almost the perfect trajectory with seas which aren't too hard to negotiate. As such we'll be making an average speed of over thirty knots!" Sylvain Mondon from Météo France explained that Franck Cammas and his men weren't to put their steed under too much pressure as it would be pointless getting to New Zealand too early: a depression moving across from Australia is currently forming a barrier at the entrance to the Pacific. With less than 16,000 miles to go before reaching Ushant, that is two thirds of the round the world to cover, Groupama 3 still has every chance of making it back in well under fifty days at sea... However, this is also the toughest section for the crew as they will be very exposed to the outside elements aboard their trimaran. "It's beginning to get very wet: it's important to stow your things away securely and adopt a very methodical attitude. There isn't a great deal of visibility and we can't see a single bird or marine mammal on the horizon! Each of us has our own sleeping bag, but we share the three bunks up forward according to the watches. It's not easy to keep your clothes dry as far as Cape Horn..."
New York YC Sailing Center at Newport. Image copyright Dan Nerney. 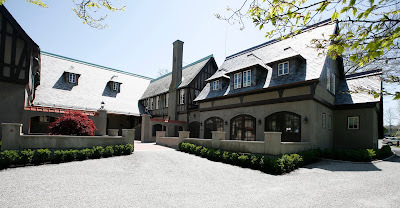 The Bermuda Race Organizing Committee has announced that the pre-start race headquarters for the 47th Newport Bermuda Race will be the Sailing Center at the New York Yacht Club’s Newport clubhouse, Harbour Court. Crews may use the clubhouse and its facilities before the race’s start on June 18, 2010. Since opening in 2008, the Sailing Center has served as headquarters for numerous regattas, including the NYYC Invitational Cup in September 2009. Built in memory of former NYYC Commodore Robert G. Stone Jr., a veteran of 24 Bermuda Races, the Sailing Center has extensive office and meeting space, as well as press facilities, showers, and ready access to parking. 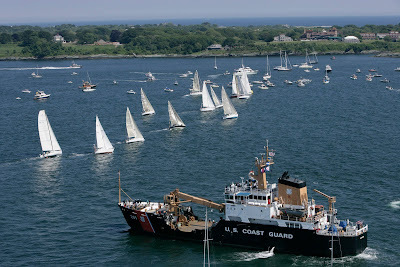 The race starts on June 18 at Newport, where the New York Yacht Club’s Sailing Center will serve as race headquarters. Applications for entry are accepted from January 18 through March 30 (registration is on-line). 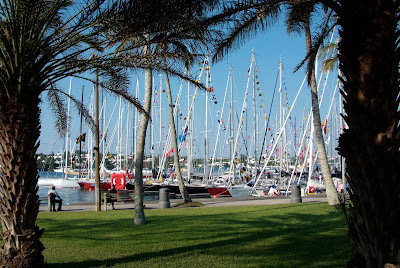 For all race information, go to www.BermudaRace.com. The Notice of Race and entry information are posted. The Offshore Racing Rule (ORR) will again be the primary handicapping system. Those electing to race for the IRC trophy will need an endorsed IRC certificate as well. If your boat needs to be measured or re-measured, notify US Sailing at offshore@ussailing.org. All boats must be inspected by Bermuda Race inspectors. The race’s Safety-at-Sea Seminar will be held at Newport on March 13, with other events on the 14th. Crew training rules and registration information are posted. Divisions and prizes: The top boat in the St David’s Lighthouse Division (amateur crews) is the overall winner. The Gibbs Hill Lighthouse Trophy goes to the winner of the professional division. The Cruising Division’s top award is the Carleton Mitchell Finisterre Trophy, the Double-Handed Division’s is the Philip S. Weld Trophy, and the winner of the Open Division (cant-keelers) is presented with the Royal Mail Trophy. The top IRC finisher receives the North Rock Beacon Trophy, presented by the Royal Bermuda Yacht Club. There also are prizes for first to finish, the winning navigator and family participation, plus the famous Galley Slave Trophy for the cook in the last boat to finish. 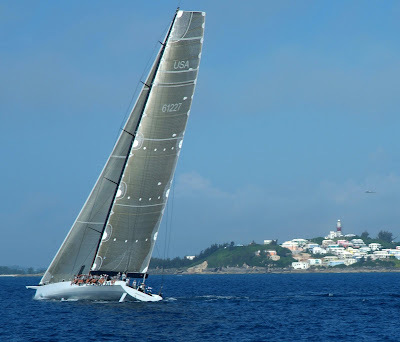 The Newport Bermuda Race is a sailing classic that stands with the Fastnet, the Sydney-Hobart and the Transpac as one of the world’s top four ocean races. One of very few international races, it is historic, prestigious, and challenging. It inspires remarkable loyalty among the many thousands of sailors who have raced 635 miles across blue water since the first 'thrash to the Onion Patch' in 1906. More than 50 men or women have sailed at least 15 races. Since 1968, an average of 160 boats has competed, in good economic times and bad. The biggest turnouts were in the most recent races—the 265-boat fleet in the 2006 Centennial Race, and the 198 starters in 2008. Sydney Football Stadium. Image copyright Frank Quealey. The Giltinan 18ft Skiff Championship look as though it will go right down to the wire as the points tighten amongst the leading contenders. 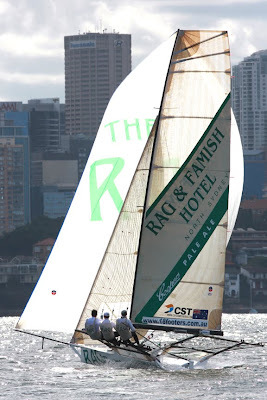 Rag & Famish Hotel was again sailed brilliantly by John Harris, Scott Babbage and Peter Harris to win their second consecutive race in race 5 on Sydney Harbour today. ‘The Rag’ once again dominated the fleet to score by 3m4s from Gotta Love It 7 (Seve Jarvin, Sam Newton and Tom Clout), with Project Racing (Andy Budgen, James Barker and Matt Mc Govern) in third place a further 58s back. The outright pointscore shows Thurlow Fisher Lawyers (Michael Coxon, Aaron Links and Trent Barnabas), 13, with a one point lead over Project Racing on 14 and Gotta Love It 7 on 15. Near miss with the Manly ferry for Rag & Famish. Image copyright Frank Quealey. While Rag & Famish Hotel appears to be trailing in fifth place, behind Grant Rollerson’s Slam, ‘Rag’s’ placing is much stronger after discard. Her 37 points would be reduced to five points and a one point lead over Thurlow Fisher Lawyers with three races still to sail. Today’s race was sailed in a 10-12knot SE wind that had many holes and variations. After a good, even start, the fleet quickly split into two groups with several teams electing to go to the west of Shark Island while most went to the east. The breeze went to the right and favoured those on the western side of the island. Kinder Caring Home Nursing. Image copyright Frank Quealey. 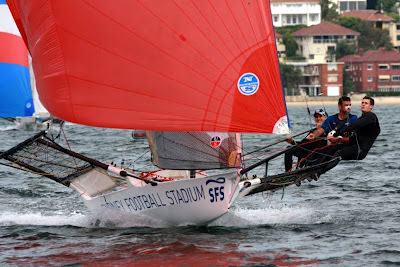 At the windward mark Oliver Merz’s Sydney Football Stadium led narrowly from Rag & Famish Hotel, CT Sailbattens (Alex Vallings NZ), Boatmate Shipwrights (Jason Waterhouse) and Team Gill Sweden (Anders Lewander SWE), which was the first from the eastern side of the island. Rag & Famish Hotel was quick to grab the lead on the long spinnaker run to Robertson Point then opened up a break of more than one minute on the following windward leg to the mark off Clarke Island. A near collision with the spectator ferry soon after was costly for Rag & Famish and allowed Project Racing and Thurlow Fisher Lawyers to reduce the margin at Chowder Bay. Gotta Love It 7 was back in fourth place but elected to tack early after rounding the Chowder Bay mark. Once again, going west of Shark Island was a winner as Gotta Love It 7 was only two or three boat lengths behind Project Racing and Thurlow Fisher Lawyers at the next mark. For Rag & Famish Hotel, however, it didn’t matter as Harris and his crew had extended their lead again – this time to more than two minutes. Obviously, with good boat speed and excellent crew work ‘The Rag’ was never in any danger over the concluding legs of the course as she powered away for an easy win. Rag & Famish. Image copyright Frank Quealey. Gotta Love It 7 continued her move on the minor placings and comfortably took second placing while Project Racing was equally comfortable in third. Down the final spinnaker run Bassett Plumbing & Drainage (Chris Skinner NZ) and Thurlow Fisher Lawyers were neck and neck for fourth place but suffered badly over the final leg in totally unpredictable wind. Within the final 200 metres Thurlow Fisher Lawyers dropped from fourth to seventh while Bassett Plumbing & Drainage fared worst by finishing in ninth place. The re-sail of last Tuesday’s Race 3 will held tomorrow with the last two races of the championship to be sailed on Saturday and Sunday. 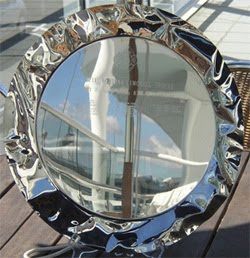 The Leith Mossman Memorial Tray - awarded to the New Zealand Womens Match Racing Champion. Kindly Donated by the New Zealand Womens Yachting Trust in memorial of our friend Leith. Image copyright RNZYS media. 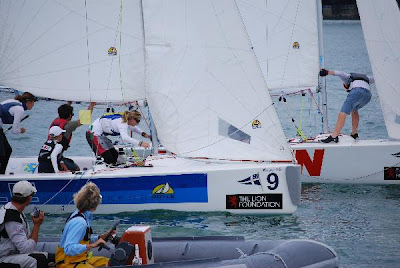 The 2010 New Zealand Women's Match Racing Championships will take place at the RNZYS, 3-7 March. The New Zealand Womens Match Racing Championships have been held at the Royal New Zealand Yacht Squadron since 2000 when Amy Waring representing the RNZYS was the first winner and received the Leith Mossman Memorial. Leith Mossman - an inspiration to us all! Leith Mossman packed more into her 45 years than most of us would in a lifetime. An avid sailor, she races on many yachts in Auckland, including Krasna (Townsen 36), The V Team (Farr 1020), Rhythm (S&S 45) to Fiji, Brighstone - Sydney-Hobart, Share Delight and Waiwera Naturally Hot (Mumm 30). Leith was alsways full of enthusiam and fun, whether racing with the boys, with the girls, match racing, fleet racing or offshore - an inspiration to us all. Unfortunately she lost her battle with breast cancer in 1998. The Leith Mossman Memorial tray was donated to the Royal New Zealand Yacht Squadron by the New Zealand Womens Yachting Trust in 2000 in memory of our friend Leith. 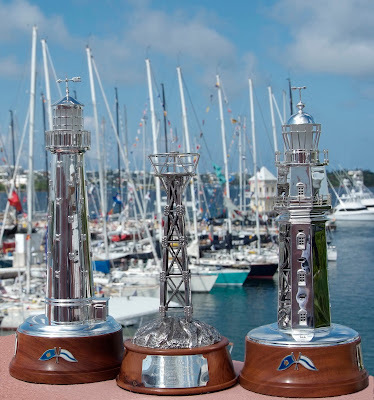 The Trophy is the principal prize for the annual New Zealand Womens Match Racing Championships held by the RNZYS. Josh Junior and his team from the Royal Port Nicholson Yacht Club in Wellington are back to defend their 2009 title and they have certainly started the right way! Winning all seven of their races today they are on top of the leader board after day one. Junior commented at last night's Opening Ceremony that he was “very lucky to have the same team sailing with him this year”, which certainly paid off today as his team didn’t make any mistakes and won all their matches by large margins. Second overall on six wins and one loss each are Jordan Reece representing the Royal Sydney Yacht Squadron and William Tiller representing the Royal New Zealand Yacht Squadron. Reece’s only loss of the day was in flight two to Stephanie Hazard and Tiller’s only loss was to Reece Tailby. Stephanie Hazard is next in fourth place overall with five wins and two losses. She started the day off in style winning all five of her races and was sitting on equal wins with Josh Junior. However in Flight Six she lost to Junior by 57 seconds and then lost to Tiller by 50 seconds. The next three teams are grouped together on four wins, Josh Porebski representing the Royal Port Nicholson Yacht Club, Will Mackenzie representing the Cruising Yacht Club of Australia and Reece Tailby representing the Royal Prince Alfred Yacht Club. The Race Committee had a great start to the day getting five flights in quickly, but then a 90 degree wind shift slowed the racing down as the course and committee boat had to be moved. The breeze was a constant 6 – 10 knots during the day and racing was very close! Racing begins at 10am Friday morning, with Flight Nine of Round Robin One. Entries are now being accepted for this year’s Superyacht Cup in Palma and already more than a dozen yachts have registered. 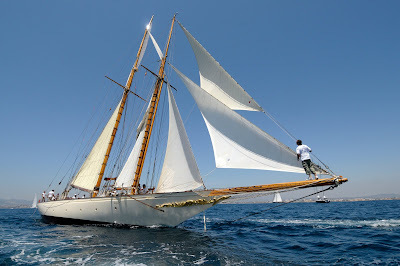 The event will take place June 23rd – 26th in the same central Palma location as the successful event in 2009. 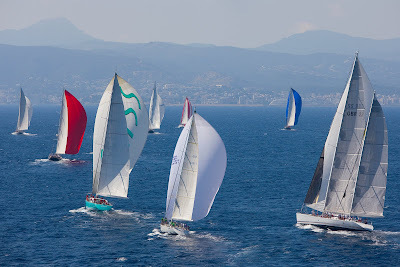 A wide-range of yachts are expected, from the most competitive racing superyachts to cruising yachts who come to enjoy the sailing spectacle and camaraderie of this unique event which is now in its’ 15th year. The racing will follow the pursuit format with ratings calculated by Jim Teeters of Bucket Ratings fame, ensuring that the sailing is closely contested and the finishes as exciting as possible. The recent Superyacht Cup in Antigua was the first chance to put the new Superyacht Racing Protocol rules to the test and it benefited from valuable input from some of the most experienced superyacht helmsmen, tacticians and crew in the world. The social programme so popular last year with all the owners, guests and crew comprises an Opening Welcome Cocktail Party on the first night, a themed fancy dress party on the dock on the Thursday night and a Yacht Hop and crew party on the Friday night. The Prize-Giving Evening will once again be held in the spectacular location of Es Baluard Museum overlooking the harbour and bay of Palma. Returning sponsors already confirmed for Palma 2010 are presenting sponsors Abu Dhabi Tourism Authority, gold sponsors Slam and Silver sponsors Atollvic Shipyard, Dimension Polyant, Ship Equip, Astilleros de Mallorca, Pantaenius and The Rolling Stock Group. Among the new silver sponsors this year are Elvstrom Superyacht, who have recently opened a new state-of-the-art sail loft in Mallorca. They are planning a superyacht sail trimming seminar at their new premises just prior to the Superyacht Cup in June and will invite participating yacht captains to a presentation and tour of their new premises. There is limited space (around 18 – 20) berths on the Superyacht Cup Dock and the total number of entries will be limited to no more than 25 yachts. 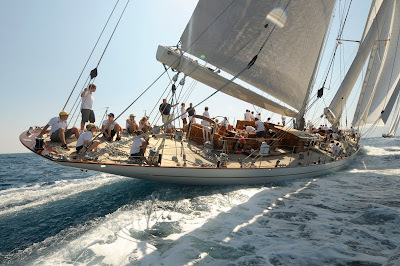 Please contact Patrick@thesuperyachtcup for further information and entry forms. Franck Cammas on board Groupama 3. Image copyright Team Groupama. "We're lacking a bit of wind, but we're very hopeful for a change in situation tonight. The boat hasn't been under pressure, despite the fairly lively conditions yesterday, and the crew know the region well! This Wednesday lunchtime we have a moderate S'ly wind, due to being at the back of the front; a front we're not managing to traverse. We've had to gybe and as we've become separated from the front, a 14-15 knot breeze has been pushing us along due East. If everything goes to plan the front is likely to come to a standstill this evening, at which point we should finally hook onto a NW'ly wind! As such we'll be able to make good speed again on course to Cape Leeuwin..." explained Franck Cammas at the 1130 UTC radio link-up with Groupama's Race HQ in Paris, in the presence of Norbert Métairie, mayor of the giant trimaran's home port of Lorient. Also on the line was Thierry Fouchier, crew on BMW Oracle, the recent winner of the 33rd America's Cup and loyal crew to Franck on Groupama 2 and Groupama 40. Albatross sighted! Image copyright Team Groupama. "The weather systems are leading us on a fairly N'ly trajectory, but that's not such a bad thing if we are to avoid the icebergs situated next to the Kerguelen Islands. We didn't take the risk of plunging further South because we might have found ourselves getting mixed up in a depression to port (and hence headwinds), which really wouldn't be great! However, our decision to remain here means that we will have to maintain a high average speed in order to stay with this favourable system." "We've got a little time to admire the décor, with the colours and light which are unique to this area! The flight of the albatrosses is really majestic too... There wingspan is impressive when they're flying in front of the bows! There haven't been a lot of marine mammals though, just two little sharks which got caught up in the foil. With the swell hitting us bow on, we're not really getting wet, though it is getting colder with the Antarctic wind. We haven't fired up the heating down below to dry our clothes yet..."
The World Match Racing Tour (WMRT) today announced the names of the nine Tour Card Holders for the 2010 season. Mathieu Richard from the French Match Racing Team also shared the same excitement. “I am very glad to have a Tour card, and I am looking forward to taking part to a fantastic 2010 championship! America's Cup: One Match Point?